Open-source offshore renewable energy is really happening. Free tools are being developed, and OpenORE will bring them all together! 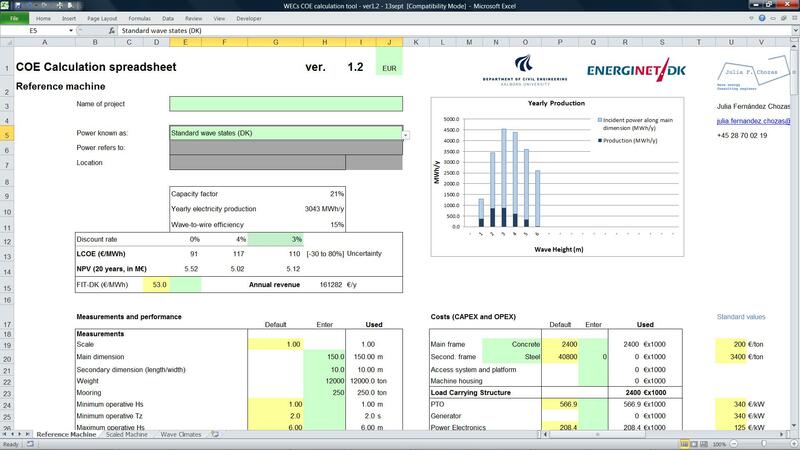 Aalborg University together with Energinet.dk and Julia F. Chozas Consulting Engineer, have released a freely available online spreadsheet to evaluate the Levelised Cost of Energy (LCOE) for wave energy projects. The open-access tool calculates the LCOE based on the power production of a Wave Energy Converter (WEC) at ten locations. Production data may derive from laboratory testing, numerical modelling or from sea trials. The tool has been developed as a transparent and simple model that evaluates WEC’s economic feasibility in a range of locations, while scaling WEC’s features to the selected site.